I could never live in New York City. Why? Because of the Doughnut Plant. This is an evilly addictive bakery that specializes in natural ingredient doughnuts and is so delicious that we went a total of five times during our two-week stay in Manhattan (we would have gone even more had we discovered it the first week of our trip and not the second). It all started because I wanted Sébastien to try a real American doughnut. He, despite having lived in the US for nearly three years, had never had one before. When I first asked him about this he was sure he had already eaten a doughnut, but his description didn’t quite fit. Upon drilling, it turned out that he had eaten a bagel – same shape, but… no. It was several years ago, at the continental breakfast table of a chain hotel along Route 66. Sébastien described one of those thawed, lifeless bagels that one doesn’t actually choose to eat. I, therefore, declared my husband had tried neither doughnut nor bagel. This had to be remedied. I myself had not eaten a doughnut in exactly 10 years – Dunkin’ Donuts’ Munchkins were quite popular when I was in college and I distinctly remember eating one senior year. I think I’d only ever eaten a doughnut once or twice in my life – remember I grew up in New Mexico, not New York. I was thus entirely unaware of the lingo when ordering at Dunkin’ Donuts. 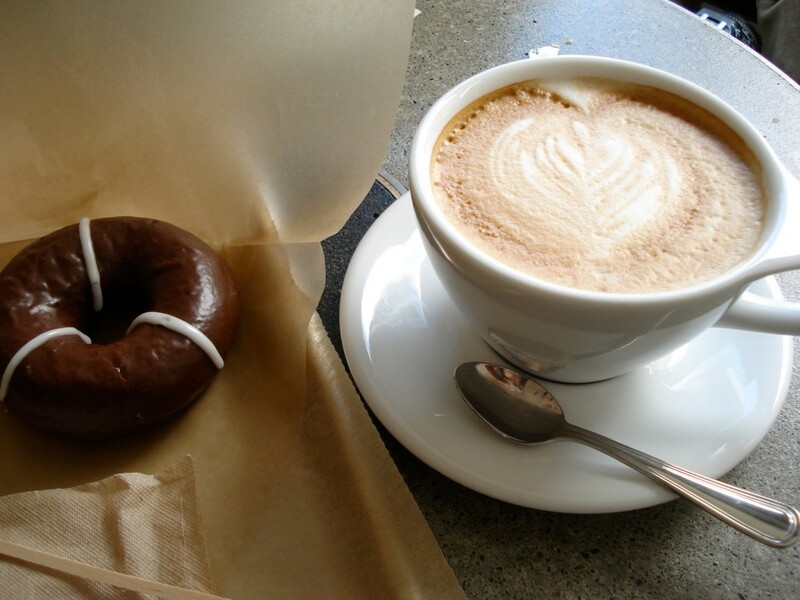 The other day, this is what I ordered, in quite a fluster because the line was going very fast: a regular coffee, a coffee with milk, a Boston Kreme Donut, a plain donut. This is what we ended up with: a coffee with cream and sugar, a coffee with milk, a Boston Kreme, a jam-filled donut. None of this, except the coffee with milk, was what we wanted. First off, the doughnuts: the Boston Kreme was my fault. Sébastien had wanted a simple white doughnut with chocolate glaze. In my confusion, I scanned the selection, eyed the glaze on top of the Boston Kreme and order it. Did it occur to me that there would be cream in a Boston Kreme? No, not until it was too late. As for the jam-filled, how did I end up with that? Maybe the woman behind the counter had misunderstood me. Or, was a plain doughnut in fact a jam-filled doughnut in New York terms? By now the woman who took the order had come over, grinning. “Here, a regular means cream and sugar,” she laughed. In the end, we got the coffee we wanted (they were nice about it) and nibbled our cream and jam-filled donuts (the coffee had been enough hassle to try and exchange these, too). They were light and fluffy, but had this underlying taste of… well… something chemical and I started thinking of some article I had once read about the life of a doughnut in your body. It was something like years. We ended up throwing out the coffee half way through. Thus, when I checked the list of “Places to Go in NY” that my friend Karen had emailed me and read “best doughnuts,” I thought we’d give them another try. The Doughnut Plant was located not far from our hotel (there are two locations in New York: Lower East Side and Chelsea). I knew I had found our place when I walked in the door and saw “Valrhona chocolate” as a flavor. At first, we were overwhelmed by the selection, but (fortunately) there was a bit of a line so we could take a minute to figure things out. In sum, there were three types of doughnuts: yeast (big and fluffy, perfect for dunking in coffee for breakfast), cake (smaller, denser and sweeter) and filled (a “doughseed” filled with chocolate or homemade blackberry jam). Over our five visits, we tried eight different flavors, including triple chocolate, blackout (with oozing chocolate inside) and, my personal favorite, carrot cake (filled with cream cheese frosting). Thus, I could never live in New York. Despite the fun we were having, it was necessary to head back to Paris. We needed to nip our addiction in the bud. This entry was posted in Restaurant Reviews, Travel outside France and tagged chocolate, New York, restaurants, travel. Bookmark the permalink. Yummmmmmmmmm! We should all have such treats. I am now thinking what to do about a doughnut here in Mexico. HaHa there is a doughnut shop down the street a block away. Will they be as good? Sounds great. Any doughnut adventures in Paris? Yes, I’m still thinking about these doughnuts and now wondering if Paris has any as good. This might be a dangerous endeavor, but I think I’ll just have to hunt some down. I may have seen some at Lili’s Brownies (35 rue Dragon) – in any case this bakery has great American-style desserts (carrot cake, for example). 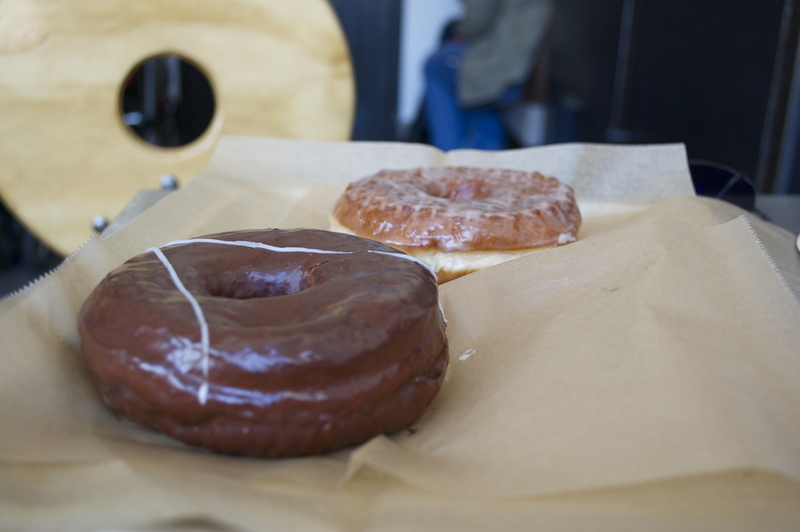 Joy, we went there and had the carrot cake donut, which was delicious– thanks so much for the recommendation! Great. Now I’m craving donuts. Lol.